I always thought fishing was a rather serene way to pass the time while on holiday. At least I did, until my husband decided to teach the children the art of casting out. Cue my panic attacks and squeals of terror to match their delighted laughter. Sound familiar? Then let’s both rejoice in this fishing activity children can try from the safety of home! 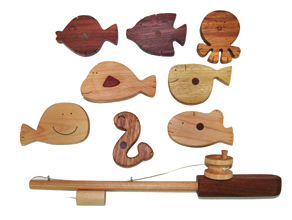 This gorgeous fishing set from Soopsori may be my saving grace (yes, I may never have to set foot on a jetty again). It includes a very smart rod complete with turning reel and sturdy fishing ‘line’, with eight sea creatures waiting to be caught. The set is handmade using up to twenty different types of wood and finished beautifully with natural linseed oil. The varying grains and colours of the wood provide a visual feast and children can see how each piece differs in look, texture and smell. The Soopsori Fishing Set is a wise investment at US$29.90. No hooks, no water and no bait make it this mum’s dream, not to mention a lot less dramatic than the real deal! The bad news is My Sweet Muffin don’t ship internationally though we hope to see an Australian stockist soon.